The 1988-89 season saw the birth of Miami Heat basketball. In the summer of 1987, the National Basketball Association was busy expanding. With no NBA team in Florida, the cities of Miami and Orlando vied for an expansion team. Unable to select between those two cities, the NBA did the next best thing: they granted expansion teams to both cities. Majority owner Ted Arison had Billy Cunningham and Lewis Schaffel handle the day-to-day operations of the franchise. Cunningham was an NBA Hall of Famer, while Schaffel previously worked as a sports agent. At head coach, the fledgling Heat selected Ron Rothstein. In their first two years of existence, the Miami Heat when 15-67 and 18-64, respectively. The best player in the early days was Rony Seikaly, a 6-foot-11 center who born in Lebanon, went to high school in Greece and college at Syracuse University. He ended up playing for the Heat from the 1988-89 season until the 1993-94 campaign. The Miami Heat took the next step toward competitiveness when they hired Kevin Loughery as head coach prior to the 1991-92 season. That year, they went 38-44 and made it to the playoffs for the first time. When Pat Riley came to town, everything changed for Miami Heat Basketball. Riley had four NBA championships on his resume and was one of the most respected people in the game. He was given the keys to the franchise before the beginning of the 1995-96 season and they saw results right away. After losing in the first round of the playoffs in Riley’s first season, the Miami Heat won 57 regular season games and made it all the way to the 1997 Eastern Conference Finals in his second season on the job. They were powered by star players Tim Hardaway and Alonza Mourning. Over the next four years, Miami Heat basketball remained elite but were never able to make it back to the conference finals. In 2001-02 and 2002-03 campaigns, the Miami Heat fell back to mediocrity — winning only 25 times in the 2002-03 season. To begin the next season, Riley handed the head coaching reins over to assistant coach Stan Van Gundy. Van Gundy would guide the Heat back into the playoffs, including another trip to the Eastern Conference Finals in the 2005 playoffs. The Miami Heat basketball team had high expectations heading into the 2005-06 season, however Van Gundy lost his job after the team began the year 11-10. Riley decided to take over as head coach again — and that ended up being absolutely the right decision. They responded under Riley and finished the regular season with a record of 52-30. 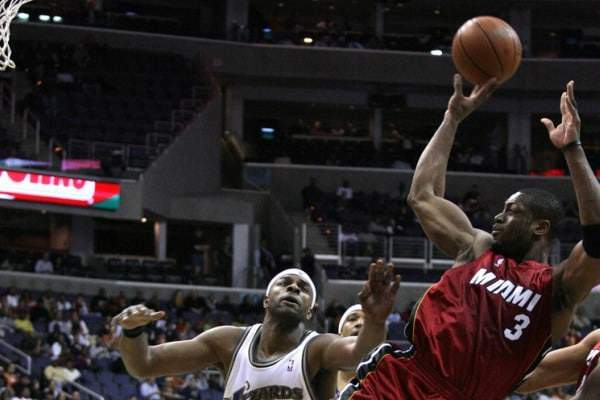 In the 2006 NBA Playoffs, the Miami Heat once again got to the Eastern Conference Finals. This time, the franchise finally got over the hump by defeating the Detroit Pistons and advancing to the NBA Finals. In the Finals, the Heat lost the first two games of the best of seven series but then stormed back. Four games later, the Heat were NBA champions. Dwyane Wade was named Finals MVP, while future Hall of Famer Shaquille O’Neal was the big acquisition that manned the center position. The long journey to the top was finally complete! The Heat have played their home games at the American Airlines Arena since it was opened in 1999. The arena is located in Downtown Miami on Biscayne Boulevard along Biscayne Bay. Ted Arison’s son, Micky Arison, is the team’s owner and Riley is the team’s general manager. Following a number of lean years early in their existence, the Miami Heat basketball team has emerged as a franchise that is seemingly in the running each and every season. The 2006 NBA championship will forever by a cherished moment for basketball fans in the city of Miami.